Northants’ Specsavers County Championship Division Two clash against Derbyshire at Chesterfield has been abandoned without a ball being bowled. No play was possible on the first three days due to a saturated outfield at the Queens Park ground, and the umpires Neil Mallender and Ian Blackwell, and captains and coaches from both sides decided after a 2.45pm inspection on Wednesday afternoon that it wasn’t worth even trying to start the match on day four on Thursday. That meant the match was officially abandoned, with the Championship clash going the same way as last Sunday’s NatWest T20 Blast match between the sides at the same venue. It has been an incredibly frustrating week for all concerned, with no action taking place despite the ground being bathed in sunshine, and Northants skipper admits it has been a ‘bizare’ few days. “It’s one of the most bizarre games of cricket I’ve ever been involved in,” said Wakely. “It’s a great ground and great place to play cricket, but unfortunatly the weather had taken its toll from the previous week with the heavy rain completely saturating the run-ups and they’re still unstable. “I think if you bowled on them for four or five overs you would be churning up mud. “We got bowlers to run in but they didn’t feel confident and with our injury issues we had to be pretty careful. Derbyshire’s T20 Blast game against Yorkshire which was scheduled for Sunday has been moved to Derby because of the unfit outfield. Derbyshire chief executive Simon Storey told BBC Radio Derby: “It’s a very tough decision in that we love coming to Chesterfield, but ultimately we need to give the game the best possible chance of being played. “Having consulted the umpires in terms of making calls on the state of the pitch for this game and looking forward, I think we have to give the game the best chance. 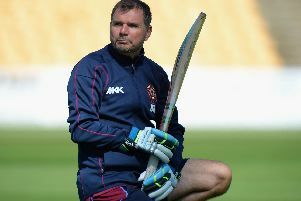 After the early abandonment of the Championship game at Chesterfield, the Northants players will now have an extra day to prepare for Friday night’s T20 clash against Notts Outlaws at the County Ground.